This contest is over, and winners were chosen. Then more bonus winners were chosen, thanks to Ben Boos donating some more prizes. See this thread for the results, winners, and honorable mentions. Want to win a cool book about Swords by an artist who worked on D2 and D2X, as well as a slot in the WoW Lich King beta, and a WoW Tyrael mini-pet? Do you want to be rewarded just for trying? Of course you do. Here’s how. Create a piece of fan art (may be digital, pen or pencil on paper, sculptural, costumed, wallpaper, etc) set in any era of the Diablo game world. Your image must feature a sword. To enter your fan art, upload the image to this folder in our Image Gallery.Entries must be uploaded into that folder to be judged. Entries must be original work; do not post someone else’s work or you will not win. The deadline for submissions is August 31, 2008. Stories must be exactly 11 words. Not 10, not 12, and yes, every word counts. Even the really short ones that are just vowels. Stories must be set or themed in some way that connects them to the Diablo world. Stories must be submitted in comments to this contest thread. You may enter more than once, but don’t spam us and push your luck. The deadline for submissions is August 31, 2008. Since not everyone is teh skillzored, we’re picking two random winners, one from the Art submissions and one from the Story submissions. Winners will be chosen from all eligible entries as of the contest deadline. Each will receive 1 WWI Paris goodie bag card. The four grand prize winners each receive the same two prizes. 1 copy of Ben Boos’ Swords book, and 1 goodie bag card from Blizzard’s Paris WWI event. 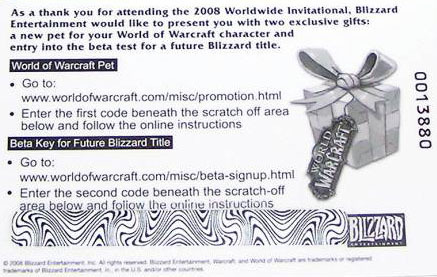 These cards contain codes that can be redeemed for 1 spot in the ongoing WoW expansion beta, and 1 WoW Tyrael mini-pet. In addition to the four grand prize winners, two more entrants will be randomly-selected to win a card with the WoW beta and Tyrael mini-pet code. See the interview with Ben Boos for details about his new book, sample images from it, and more. It’s delicious. You can read the fine print on the WWI card in this photo. The beta slot is only redeemable in the ongoing WoW Lich King beta. If you don’t use it for this beta, it’s dead. It won’t work to get you into the D3 beta. If you don’t play WoW, I’m sure you’ve got some friends who do, and ultra-rare WoW pets like the mini-Tyrael are greatly sought after. The short story contest winners will be selected by Diii.net site staff. The fan art winners will be selected by Ben Boos, in consulation with Diii.net site staff. The two random winners will be selected by a roll of the dice. All winners will be notified in early September, shortly after the contest deadline. All entrants must be registered forum members of this site (you can’t post a comment or upload an image if you’re not). In case of technical difficulties posting images or with urgent contest questions, contact Flux via a PM, or email him: fluxATdiii.net. All entries to the 11 word story contest must be posted in comments to this thread. The deadline for submissions is August 31, 2008. Stories must be exactly 11 words. Not 10, not 12, and yes, every word counts. Even the really short ones that are just vowels. Stories must be set or themed in some way that connects them to the Diablo world. We’d accept entries along those lines, except that ours goes to 11. Stories must be set in the Diablo world, or at least refer to it. For example, the first winner PA picked could be changed to “Mrs. Diablo,” except of course it’s already been done. Diablo 1, 2, 3, the novels, the history, etc. All is fair game. Stories are not required to mention a sword, but that’s probably not a bad idea, given the theme we’re running with here. In the case of identical, or very similar stories, whoever posts their first gets the credit.